I’ve taken a bit of time off while some website changes were made at Loghouse, but now I’m back with more recipes and thoughts of spring to share with you. Back in January, I began snacking on the first tender leaves of wild sorrel as I weeded my way through the garden. Now, there’s enough of both the wild sorrel and the French garden sorrel to cook with. Last year, a reader reminded me that to some folks, wild sorrel means wood sorrel (Oxalis oregana), a clover-like carpeter of the shady forest floor. That is NOT the kind to cook with or eat. The wild sorrel often used in salads or cooking is a common weed (Rumex acetosella) that forms small, leafy rosettes in winter. By March, taller stalks shoot up, tipped with tiny, dock-like red flower-ettes. Now, in April, wild sorrel spreads in carpets of long stems trimmed with skinny leaves that have a brisk, lemony tang. 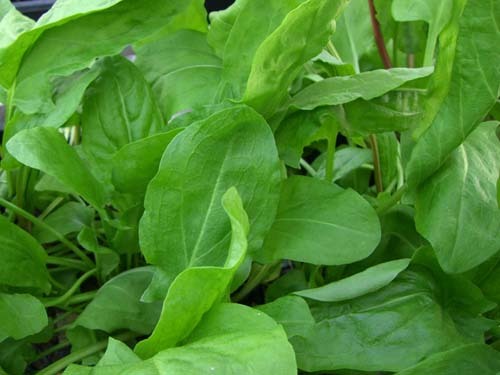 French sorrel (Rumex acetosa or R. scutatus) is a larger, more richly flavored cousin. The most common type, ‘Blond de Lyon’, boasts large, succulent, mild yet still citrus-tasty leaves. Each spring I invent a new recipe for this refreshingly tart herb. This year’s sorrel soup combines garden sorrel and spinach with leeks and fresh thyme. If you’ve got loads of sorrel, use up to 6 cups of it and less or no spinach. I like to garnish this silky soup with wild sorrel, which has a lovely sour-lemon flavor that can’t be beat. However, if your garden lacks weeds and you can’t find any (poor you), Italian parsley makes a tasty garnish as well. Heat oil in a saucepan over medium high heat. Add leeks, sprinkle with 1/4 teaspoon salt, the pepper and thyme, and cook until tender (about 10 minutes). Reduce heat to low, add sorrel and spinach, cover pan and cook until limp (2-3 minutes). Add broth, adjust salt to taste, and simmer until warm (do not boil). Blend with an emersion blender or in a food processor until smooth. Serve garnished with wild sorrel or parsley. Serves four. This foamy, spunky green sorrel sauce is an excellent counterpoint to the richness of wild salmon, and complements haddock, trout, and rockfish as well. Serve it over any grilled fish with garlic rice and a green salad enlivened with fresh herb tips. Preheat oven or prepare grill. Rinse fish, pat dry and rub with oil. Sprinkle skinless side with half the salt and pepper. Grill skin side down until fish turns opaque and flakes easily (6-8 minutes). While fish cooks, combine remaining salt and pepper, herbs, and sour cream or yogurt in blender or food processor and blend. Serve fish with sauce, garnished with lime wedges. Serves four. The sumptuous sorrel souffle pie combines sorrel and young spinach with creamy ricotta and tangy asiago cheeses. This golden puff of a pie is easy to make yet delectable enough for company. Preheat oven to 350 degrees F. Put piecrust in pie dish, crimp edges, and rub lightly with oil (about 1/2 teaspoon). Combine remaining oil, garlic, and onion and cook over medium heat, stirring, until onion is pale golden (3-5 minutes). Add shredded sorrel and spinach, cover pan and cook until greens are wilted (3-4 minutes). Uncover pan, remove from heat and set aside. In a bowl, beat eggs lightly, then stir in ricotta a spoonful at a time. When mixture is blended, stir in 1 cup grated cheese, flour, salt, pepper, nutmeg, and wilted greens and stir well. Fill pie shell evenly, topping with extra cheese. Sprinkle with remaining cheese and bake at 350 degrees F until puffed and golden brown (35-40 minutes). Serve at once. Serves 4-6. This entry was posted in Recipes, Sustainable Gardening, Sustainable Living and tagged Salmon with Sorrel Sauce, Sorrel Souffle Pie, Spring Sorrel Soup. Bookmark the permalink.